It is a pity that poor picture quality from the many CCTV systems in London is affecting the positive identification of looters. For the police to just release 15 images today is surely a reflection of this. Furthermore the burning of so many buildings has destroyed the CCTV systems – this could have been avoided had the CCTV systems considered resilience in their design. If resilience had been considered when these systems were designed the video images would have been recorded off site and would have been valuable evidence for the identification and prosecution of the arsonists. CCTV as ever is all about the image quality and we take a closer look at the benefits that IP based CCTV can bring along with Megapixel cameras that improve image quality in the article “CCTV image Quality is everything”. Integrated security: The future of CCTV and Access Control? The vast majority of functionalities across security systems are common. So, why are you still working with multiple independent systems? The Security Center blends Genetec’s IP ANPR (Automatic License Plate Recognition), CCTV video surveillance, and access control systems, AutoVu, Omnicast and Synergis, within a single innovative solution. Break free from running multiple client applications, or working with cluttered desktops. You no longer have to deal with inefficiencies that result from inconsistent workflows and limited integrated functionality. Instead, you can experience the simple and compelling performance of an ultra-modern solution. The Security Center offers you a single unified interface designed around simplicity of operation. The unified security platform will streamline every facet of managing your business, physical security and public safety applications. It’s simply that powerful. Unified Security Interface: The Security Desk is the unified user interface of the Security Center. Its compelling design and innovative task-based approach allow you to efficiently control and monitor multiple security and public safety applications. Distributed Client-Server Architecture: Benefit from high configuration flexibility with the Security Center. Distribute services and client applications across several servers or off-the-shelf workstations. Scalable Multi-Site Monitoring: Unify multiple independent video and access control systems under a single virtual system with the Federation feature. Federate hundreds or thousands of remote systems for city-wide surveillance and managed central monitoring services. Centralized Alarm Management: Avoid the traditional approach of separate alarm monitoring applications with unsynchronized data for your different security systems. Configure, monitor and respond to alarms for your entire security environment. Multi-Tenant Functionality: Segment operations per tenant or managed services account, and assign privileges per site with the Partioning feature. Give individual site managers or tenants their own sites to manage in parallel to any centralized monitoring. Visual Tracking: Switch from one camera to an adjacent camera within a viewing tile when tracking a suspect, either in real-time or playback mode. Genetec Software Development Kit (SDK): Integrate building management systems, enterprise resource planning systems, intrusion detection systems or develop custom business applications with the Security Center’s open SDK. Advanced Reporting Capabilities: Generate a variety of integrated LPR, video and access control reports without the use of external third-party reporting tools. For more information about the Security Center download the Security Center brochure. If you have any questions or would like systems requirement info, supported hardware etc. or need help specifying the right management system to meet your needs call us on 0844 225 9 225 or email Controlware for expert advice. CCTV control room – upgrading, extending or integrating security systems? Controlware’s extensive experience, knowledge of IP based systems and background in CCTV enables us to assist with CCTV control room upgrades, systems integration and refurbishments. The principal behind a CCTV control room upgrade is to improve security management and the operating environment for staff. This can be achieved in many ways including implementation of an IP based Intelligent IVMS system as a stepping stone to developing a full C4i (Command, Control, Communications, Computers, and Intelligence) solution for the growing needs of managing multiple security systems through a single platform. The use of an open protocol and non‐proprietary system enables users to not be tied to individual vendors or support structures and can grow the system as both operational and budgetary requirements are identified. If you are looking at getting more from your control room, improving operations and integration of security systems why not give Controlware a call to discuss the options available on +44 (0)844 225 9 225 or email video@controlware.co.uk. Encoders convert analogue CCTV to IP video and provide an easy way to upgrade your analogue to IP. You can acquire all the benefits that digital technology offers while retaining your investment in your system. As leading value-added distributors of IP CCTV products and systems Controlware provide a wide range of product options to suit all requirements and budgets together with the advice and support to future-proof your CCTV. Axis encoders combine high quality video encoding with a low cost per channel making them an extremely attractive choice. 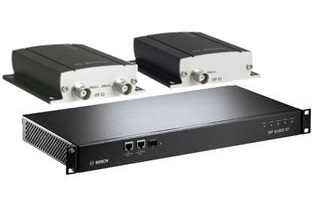 Axis encoders are ideal for bandwidth efficient, high density encoding requirements. Find out more here or call 0844 225 9 225 for best prices. Bosch provides a range of new H.264 highly single channel and multi-channel video encoders. Bosch encoders combine high reliability, optional video analytics and all the components for a complete end to end solution. Siqura by Optelecom-NKF encoders provide single channel and multi-channel encoders built for tough environments and temperature ranges. The range includes video encoders, flexible install options such as CCTV over fibre and modular switches that are all housed in a universal chassis. Need help selecting the right encoder for you? Controlware has been at the forefront of IP systems for more than a decade. During this time we have developed our value added services to assist installers and integrators. Technical services including specification, system design and support ensures that you benefit from the best technical solution at the right price point. Call 0844 225 9 225 or email us with your solution requirements today and we can advise the right product or system for you. CCTV channel interview with A&S International feature concering how Controlware can help CCTV installers and integrators get the most out of IP systems. Q1. In what capacity do you work with traditional installers specializing in analogue technology? How do you complement each other? Controlware: Due to our experience and skill set with IP video built up over the last 15 years we can offer the missing knowledge or support that the traditional analogue installer doesn’t have – This could be system design, commissioning, hardware sourcing (switches, servers etc.) or maintenance. Q2. What are the usual problem areas (such as technology integration and installation techniques), and how do you solve them? How are compromises made? Controlware: The usual problems are either around migration and leveraging legacy equipment and correspondingly any proprietary issues that might be faced such as telemetry or integrating hybrid systems. The compromise is usually to either to have a managed migration plan that may involve additional hardware on a temporary basis or to accept reduced functionality for a period. Q3. Has there been any case/project where it was simply easier to go all analog or all IP? Did you? Why or why not? Controlware: We are currently rolling out a project for process control / improvement with a utilities company where, due to their IP VPN, it was easier to implement IP as all the WAN transmission infrastructure was already in place. Therefore we could save costs and still improve remote site functionality and Health and Safety. Q4. What can traditional installers do to better learn the IP/IT language? Controlware: If installers wish to learn more about IP / IT then they should work with a trusted partner who has experience in IP and can help them develop their skills by working closely on projects and can then continue to help them in future opportunities through improved pre / post sales support. This type of relationship is core to the Controlware partnership ethos. Q5. What are you doing to better learn the analog/installation language? Controlware: We understand the challenges that our installer partners face and we have a good knowledge basis on analogue implementation through undertaking industry recognized training but as we see IP as the future we don’t feel the need to invest heavily in this area. Q6. What training programs are offered by manufacturers? What training programs are offered by IP/IT specialists like you? Controlware: One of the challenges with manufacturer led training is that they are very product specific to that manufacturer whereas what the industry needs is wider IP / IT training on system design and networking such as switching technology, server specification or operating systems. Within the Controlware group of companies we have a dedicated training organization called ExperTeach to provide exactly this missing link to our partners. Q7. Is there any other support available, from manufacturers and from you? Controlware: Most manufacturers can help with system design but again this tends to be limited to their own products and misses components like servers or switching or integration with legacy equipment. Controlware are able to supply a complete consultancy, design and implementation service to what level the integrator requires. Q8. How is effectiveness measured — number of new customers? Controlware: This is difficult to measure – What I think you are seeing is different types of engineers coming through which allows traditional installers to bid on more and more IP based projects. This in turn is opening up more business to them in different areas / verticals. Q9. What is the working dynamics like between your company and the manufacturer partners when it comes to after-sales customer service/maintenance/troubleshooting of integrated, IP-based systems? Controlware: We are able to provide 1st, 2nd and even 3rd line technical support as we understand IP completely and test / train all our pre / post sales engineers on all the products we supply and additional training on software and networking qualifications and undertake a lot of testing and systems approvals before signing over a project. This is backed up by a full test and evaluation lab where we can fault find in the event of issues being highlighted by our integrators. Q10. What issues can your company handle on itself, and what issues get referred back to the manufacturer partners? Controlware: Due to the high level of training, test equipment and experience we can handle most problems ourselves and only refer back issues with things like firmware / software faults or clearly faulty hardware. Most times we are able to give these manufacturer partners detailed feedback on the issues such as how and when the fault occurs and can be replicated, additional logging information or isolation testing to be able to eliminate other factors. Q11. For customers who have come to adopt IP-based security products, what were the top three driving forces? Controlware: I would say the drive is improved functionality and reliability, IP being seen as the technology of the future (increased deployment of structured cabling, remote communications etc.) and not having to rely on proprietary equipment. Q12. How was the higher cost justified? How was ROI proved or improved? Controlware: While the item to item cost maybe higher IP based systems have been shown to have a lower TCO than analogue and also RoI is shown through higher uptimes, greater resilience / redundancy and improved functionality and flexibility in deployment. Q13. Among your customers, what verticals lean more toward using IP-based security equipment? Controlware: Education is a key adopter of IP as they tend to be more forward looking but we are seeing more and more utility suppliers and infrastructure partners looking at IP as they upgrade networks and also Healthcare are looking more and more at IP. Q14. Any specific vertical(s) that your company wishes to break into with networked security products? Why? Controlware: Retail is always of interest due to the size of the estate and deploy base. I also think that, with proper planning and implementation, that IP has a lot to offer in both legal compliance, health and safety and marketing as well as traditional security. Q15. What are some issues that need to be addressed in order for networked security products to gain further traction and adoption? Controlware: The knowledge base is a key point both in the installer base and system specifiers as is the entry price point of IP in certain areas. Recording platforms / hardware also needs to be reviewed to make IP easier to adopt for both end users and the installers. Q16. Any other anecdotal success stories? For the geographical markets/regions that you are active in (please identify which), what kind of growth in IP-based security systems are you expecting for 2011? Controlware: We expect to see good growth in IP through 2011 but it is difficult to put an exact number on it due to the challenging global conditions in different regions. What we are seeing, however, is not only a migration of traditional security to IP but also projects around process control and health and safety compliance – IP fits these types of installations due to their flexibility and reduced TCO costs as they are easier to install, integrate with existing infrastructure and provide far better redundancy options and these arguments can be carried back into the traditional installation base. If you are interested in becoming a Controlware channel partner sign up here. Contact us today to discuss your requirements at exclusive prices while limited stocks last! Bosch CCTV products are well known for their quality and durability and are ideal for CCTV systems and security requirements of all sizes. Controlware provide all the assistance you need to select the right Bosch CCTV product based on more than 15 years experience with the product range. You can be assured that you will get the highest quality assistance to select the products that meet your needs at the best possible prices. As a value added distributor Controlware provide not just market leading products from leading CCTV manufacturers but services such as free system design, consultancy and support services.